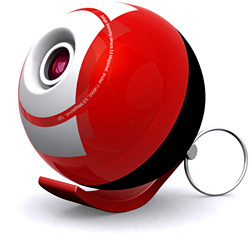 SatuGO Bouncing Ball Digital Camera | OhGizmo! While it looks like an ordinary ball-shaped webcam the SatuGO camera stands out for the simple fact that it is an actual rubber ball. Created by Dutch designers Eschel Jacobsen and Mads Ny Larsen the SatuGO camera can be safely thrown like any other ball and instead of shattering into a thousand pieces upon impact it will instead snap a photo. Or you can set the timer and have the camera capture shots in mid-flight if you prefer some aerial photography instead. While it’s an interesting idea given the camera’s size I question how well it will be able to take unblurred shots while it’s bouncing all over the place. As for availability, when the website for the product includes a ‘Manufacture Needed’ (their spelling) section it’s pretty obvious these won’t be hitting retail shelves any time soon. However the designers have already estimated the cost for the SatuGO to be about $69.